Alderac Entertainment Group will be offering game retailers an opportunity to bring Big Game Night to their stores before Gen Con with a special prerelease promotion this August. Participating retailers will be able to sell all three of the Big Game Night titles the day before Alderac�s annual Big Game Night unveiling at Gen Con. The in-store pre-release and Gen Con will be the only way to purchase these titles before their broad release on September 6, 2019. Alderac is also revealing the games involved in advance of Gen Con, allowing retailers to more fully participate in this year�s event. This year�s games are Curios, Point Salad, and the previously announced Walking in Burano (see "Art-Inspired Games from Alderac this Summer"). In Curios, players take on the role of a rogue archaeologist, traveling the world for lost artifacts. Using a combination of worker placement and deduction, players obtain artifacts from treasure sites without knowing their value. Players will have to combine the knowledge of their cards and what their opponents have revealed to determine an artifact�s value. Curios is for 2 to 5 players, ages 14 and up, and plays in 15 minutes. In Point Salad, players are trying to craft the perfect Salad. Drafting from a deck of double-sided cards, one side featuring veggies and the other featuring one of 120 scoring methods, players collect cards to score for one side or the other. Players have to be careful, however, as some scoring methods negatively affect some veggies. 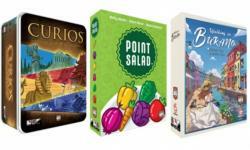 Point Salad is for 2 to 6 players, ages 14 and up, and plays in 15 minutes.